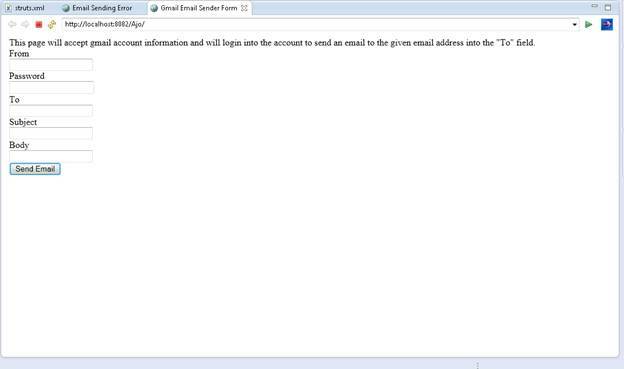 In this article, we will learn the requirements to send an email and the process to send email using gmail mail server. Every web application needs to send an email as a response for an activity being performed against a request made by client. To send an email, we are required a mail server url and communication port to send email. In this article, we will be using gmail mail server that sends email using port number 465. A struts framework is used to create web application and provides an api to send emails. To send an email, first we need to configure a gmail mail server setting into our web application using a struts framework action. Now, we are required to place necessary email information that are required to send an email like sender email id, password, receiver id, subject of the email, and body of the email. These are defined as action class variables. Hence, create their getter() and setter() methods respectively. In the next step, we define a execute() method that defined a Session class object using properties type object and Authenticator class of javax.mail package. In the next step, we defined a Message class object that configured a message that was being sent. A static method send() of class Transport was used to send this email that accepted Message class object as parameter. Now create a user interface to login into the gmail account. This account will be used to send an email to receiver. An email will be sent to the given email address in the text field of index.jsp. This page will accept gmail account information and will login into the account to send an email to the given email address into the “To” field. In the above code, a html form was used to send an email using gmail mail account that accept a gmail account id and password, recipient address, subject and body of the email. A submit button was created to submit email login information and email sending information. Once a html form is submitted, it will hits an action class using struts.xml configuration file. It will hit “emailer” action in the struts.xml file. The above code defines a tag to define the xml version and encode type and defines the struts document type definition. 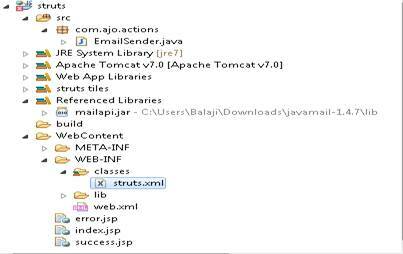 The <struts> tag is used to configure the struts web application and accept an action named “emailSender” defined in the sub – tag <action> of <package> tag that is the sub – tag of <struts> tag. If email is successfully sent, a success.jsp jsp file is loaded by web server as a response to user, otherwise it loads the error.jsp jsp page. The above code creates a web document to inform the user that an email has been sent successfully. It seems that there is a problem sending your email to <s:property value="to"/>. Please check for credentials. The above code creates a html document to the user that informs, there is an error, while sending your email to the given email address. To run this web application, there is a main configuration file that is web.xml file (a web application deployment descriptor for the web or application server). It manages incoming requests to the server for the application and transfers it to the struts.xml configuration file. The above code uses a filter dispatcher class to transfer all the incoming request to struts.xml configuration file. Above figure shows an interface to send an email. 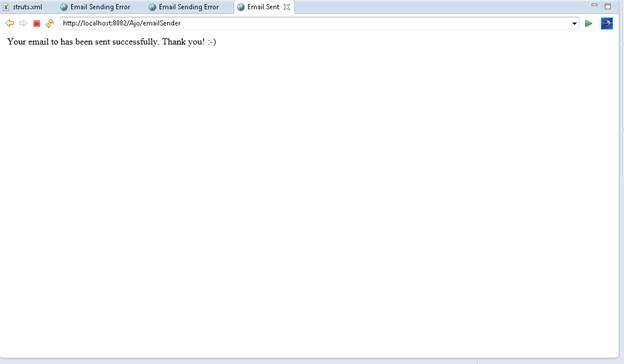 If an email has been sent successfully, success view is loaded. This pages is loaded, if there is something is wrong, while sending an email. Above figure shows the directory structure of the application. What are the requirements to send an email? How do we send email using gmail mail server? Have more than 5 years experience about Java, .Net, C and C++. Hi, Have you tried adding a doctype to your Struts: <?xml version="1.0" encoding="UTF-8" ?> <!DOCTYPE struts PUBLIC "-//Apache Software Foundation//DTD Struts Configuration 2.3//EN" "http://struts.apache.org/dtds/struts-2.3.dtd"> <struts> ... </struts> ?